Updated! 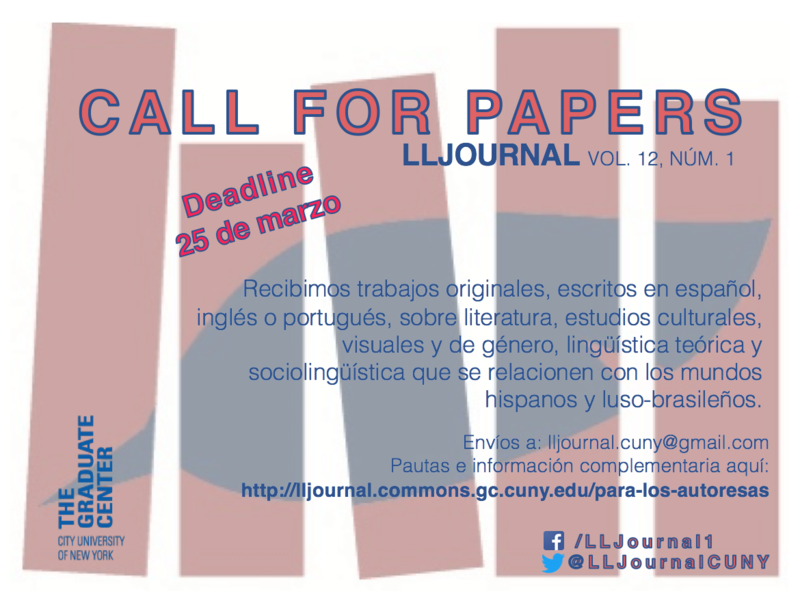 The editors of the LL Journal have extended the deadline for submissions to March 25, 2017! 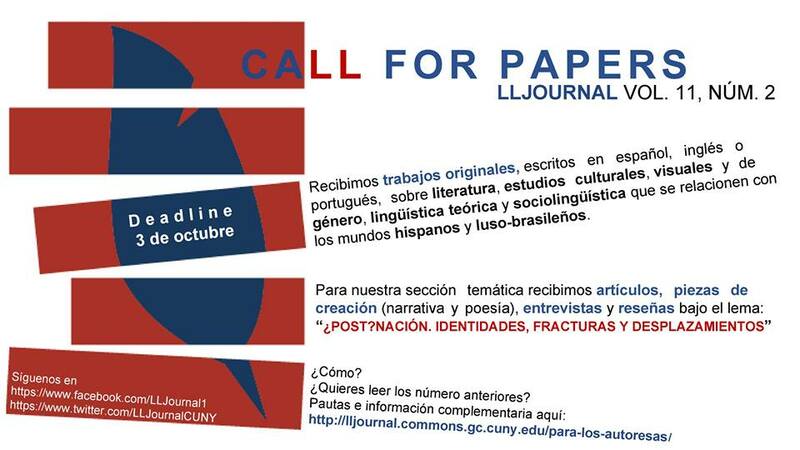 The LL Journal is a publication of the students of the Hispanic and Luso-Brazilian Literatures and Languages PhD program at the Graduate Center, CUNY. Find out more about the LL Journal and browse their most recent issue (Vol. 11, No. 2) and archives on their Commons site. Recibimos trabajos originales en español, inglés o portugués, sobre literatura, estudios culturales, visuales y de género, lingüística teórica y sociolingüística que se relacionen con los mundos hispanos y luso-brasileños. And be sure to check out the LL Journal on Facebook and Twitter! 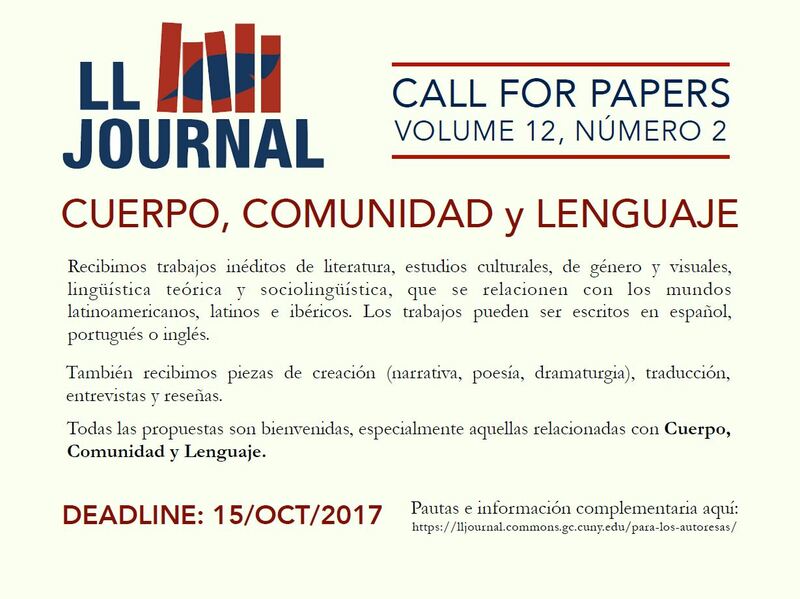 Nuesto LL Journal se complace en lanzar la convocatoria para el segundo número del volumen 12, “Cuerpo, Comunidad y Lenguaje.” Envíe su trabajo para el 15 de octubre. Para pautas e información complementaria haga clic aquí. 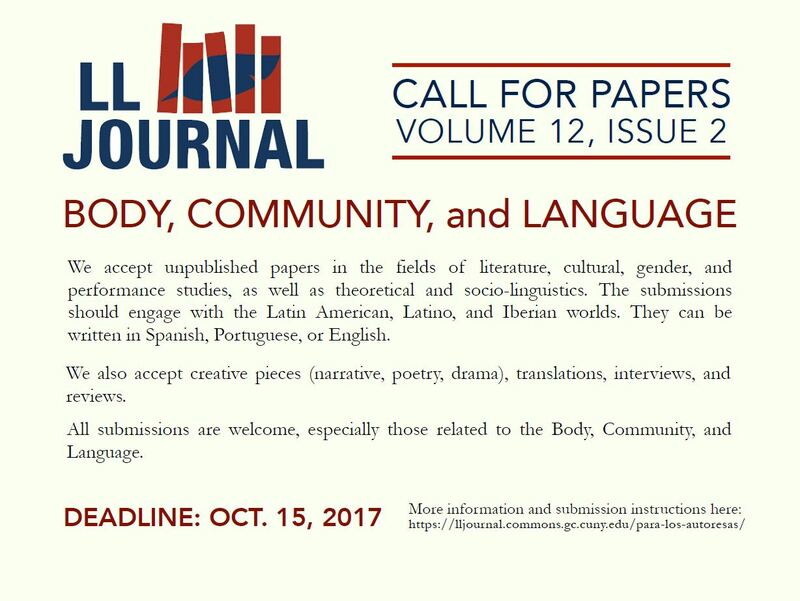 Our LL Journal is pleased to announce its Call for Papers for the second number of volume 12, “Body, Community, and Language.” Please send your submission by October 15. For guidelines and more information click here. The Critical Theory Certificate Program at the Graduate Center of the City University of New York in conjunction with The Center for the Humanities presents the fifth annual interdisciplinary conference on Critical Theory to be held May 5th-6th, 2016. 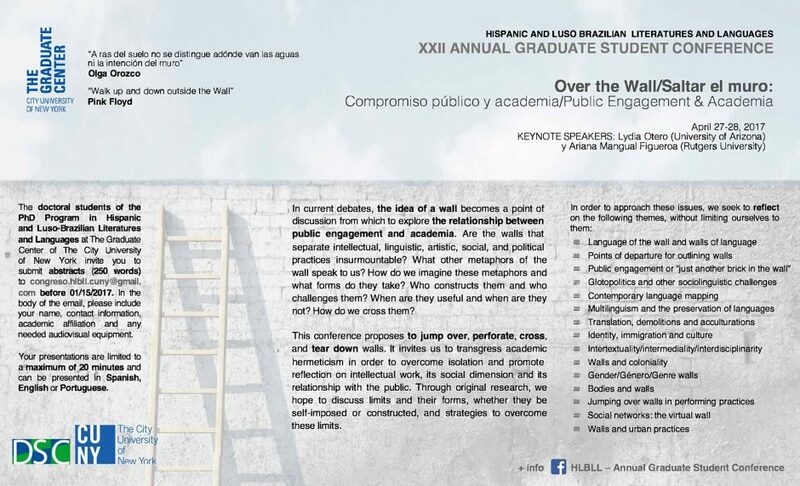 This year’s conference will be devoted to the theory and practice of translation. Please submit a 300-word abstract to translationtheorytoday [at] gmail [dot] com by March 1st. Proposals should include the title of the paper, the presenter’s name, a 50-word bio including institutional and departmental affiliation, and any technology requests. We also welcome panel proposals of three to four papers.